Wireless Earbuds for iPhone 7? Yes, Please! Could this be it? Are we finally going to get wireless earbuds with iPhone 7? If so, then we here at LureofMac are super excited. So much so, that we’ve decided to dedicate an entire article to talking about the concept of wireless earbuds, how they came about, what models of wireless earbuds already exist, and also which are the best wireless earbuds. We’re also going to look at how wireless earbuds compare to typical wireless headphones (over-ear). But before we go into this, we should point out the exact details surrounding this wireless earbud for iPhone 7. I mean: are they actual, plain wireless Bluetooth headphones? Or do they have something more? Is there a microphone included? All these are valid questions: let’s see what the iPhone 7 rumors are telling us! I don’t think we’re asking for the impossible here. I mean, just look at the range of wireless earbuds already available (check that out below). We should assume that it wouldn’t have been too hard for Apple to include those earphones with the iPhone 6. However, the tech giant chose to postpone its mission until the 7th version of its flagship device. However, rumors are now shedding light on the subject: no more delays, we’re getting wireless earbuds with iPhone 7 devices. For the sake of structure, we’ve made a list of all that’s rumored up to now. Apple may scrap the jack. You heard it here first (probably): Apple is rumored to be looking for ways in which to ditch the classic headphone jack port. Instead, the same rumors specify Apple will be opting for either lightning earphones for iPhone7, or for Bluetooth headphones for iPhone 7. These wireless earbuds could be part of the solution to making the smartphone superstar get even slimmer. Apple is developing wireless Bluetooth earbuds. While these headphones will release at the same time as the iPhone 7, it’s unclear whether the wireless earbuds for iPhone 7 will actually be included in the box. Chances are, however, that the iPhone 7 will ship with basic, lightning port earphones, with the option of paying more for the wireless earbuds. They will probably have a microphone. Good news for Siri: now its loyal friends can call it up even while riding the subway home. The new microphone included with the wireless earbuds will probably feature noise canceling tech the likes of which have never been seen (or heard?). Now Siri will hear everything you say. Everything! The internet likes to give names to everything. Typical iPhone headphones are named EarPods (because of their sleek, white look). It’s only natural that the internet has already come up with a name for the wireless earbuds. They’re called AirPods… because they can move through the air? I never could understand the logic behind how the internet chooses to give names. There’s a petition against it. It’s like there’s a petition for everything nowadays. This one advocates for keeping standard headphone jack in the iPhone. More than 250,000 people have signed this petition. So, what models of wireless earbuds do we have now? Quite a lot: there are the Motorola S11, the Denon AH, the BlueAnt Pump, the LG Tone+, and even the Plantronics BackBeat GO2. However, there’s just one tiny problem with all these models plus all the other ones available: they’re not truly wireless. Their biggest flaw is that they have a cord in between them. Some, like the Plantronics ones, even have a traditional cable which connects to a wireless receiver. Pretty dull, wouldn’t you agree? 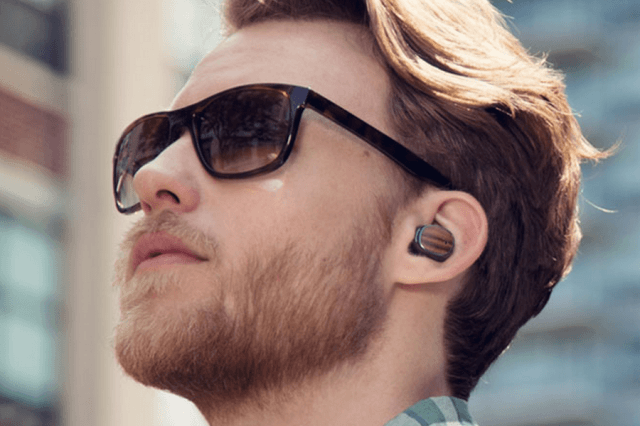 There’s the Motorola Hint, on the other hand (pictured above), but the reviews for these wireless earbuds have been far from great (they’ve been bad, especially criticizing sound quality). So the biggest challenge for the iPhone 7 team will be to come up with a pair of headphones which will have absolutely no cable. At all. According to early images (which probably have nothing to do with Apple), these wireless earbuds should look like little buttons to put in your ears. So, what do you think of the idea of giving iPhone 7 users wireless earbuds? Crazy, right? Next thing you know, we’ll be walking around with microdevices implanted in our ears which can receive sounds wirelessly. Or is that such a bad idea? We’ll leave this up to you. Tell us what you think about wireless earbuds for iPhone 7 in the comment section!